Everyone loves to receive a handmade card and Christmas is the perfect time to get crafting! Take a look at this fantastic card made by Debbie Frost. For the snowman, Debbie has covered a piece of flat white card with the Double Sided A4 Tape Sheet before die cutting the body. After assembling the snowman she has covered it with the Rainbow White Iridescent Glitter. For the background Debbie has punched some stars, placed them onto the Tinted Blue Card and then removed the second backing sheet before adding glitter. 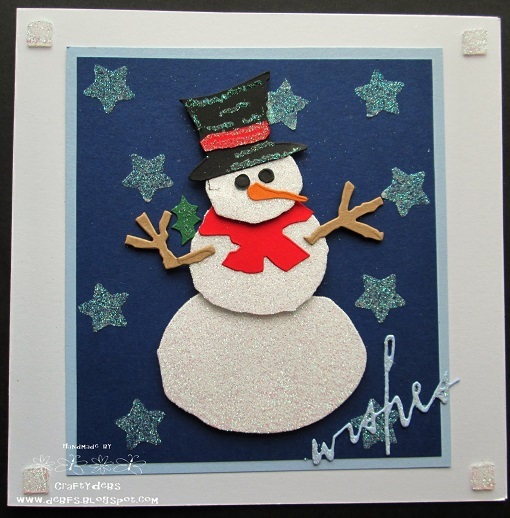 She has used the Clear Foam Pads at the corners of the card to embellish the design with more sparkle. Visit Debbie's blog for more of her fantastic makes.